Welcome to the game of Reversi, which is a classic board game dating back to late 19th century England. In this game, teams take turns placing black and white discs (that look like checkers) on an 8x8 game board. If one color surrounds checkers of another color in a straight line or on a diagonal, then that color can flip the checker of the other color to that player's color. The winner has the most checkers of their own color at the end of the game. 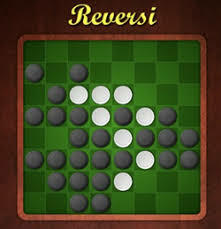 There have been a number of variations of Reversi played throughout the years. In classic Reversi, the game starts with an empty game board before teams begin placing checkers one at a time. 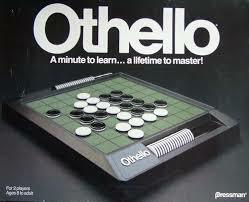 The most commonly played modern version of the game has been marketed as the Othello board game since the 1970s. 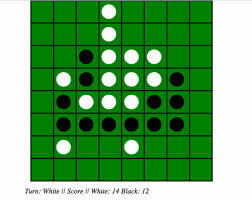 In the Othello version, the game begins with two black and two white pieces placed in the middle of the board in two rows of alternating black and white pieces. During each team's turn, they must flip at least one disc of the other color. Play continues until one team is unable to perform a move where they can flip one of other color's pieces. The team with more pieces of their color than the other team is then declared the winner. Othello is the most recognizable version of the Reversi game, due to its marketing as a popular board game. In my Reversi app, I have turned the board game into a game that can be played on a desktop computer or a mobile phone. This game can be played in a classic two-person version, where two people take turns playing the black and the white pieces. I also have developed solo versions where you play the black pieces, and the computer program plays white pieces at random. Therefore the game becomes you playing against the computer, relying on your intelligence and strategy to place black pieces around the randomly places computer white pieces to flip them and win the game by finishing with more black pieces on the board than white pieces. A scoreboard at the top of the screen keeps track of how many black and white pieces are on the board at any given time. But you are a reasonably intelligent person. Being able to win a 1 vs. 1 game vs a random computer player should be easy, shouldn't it? That is why I have created more challenging version, where the computer can drop two, three, four, or even five pieces at a time. Since you possess the ability to reason, then you can defeat a computer opponent dropping multiple pieces at a time at random? Or can you???? There, I have created links to the classic two-person Reversi game, as well as the solo versions where you can play 1 vs. 1, 1 vs. 2, 1 vs. 3, 1 vs. 4, or 1 vs. 5 against the computer. How good are you? Can you defeat the computer at 1 vs. 2, or even up to 1 vs. 5. Try and find out. The classic version utilizes the classic 8x8 grid green game board seen in the classic Reversi/Othello board game. 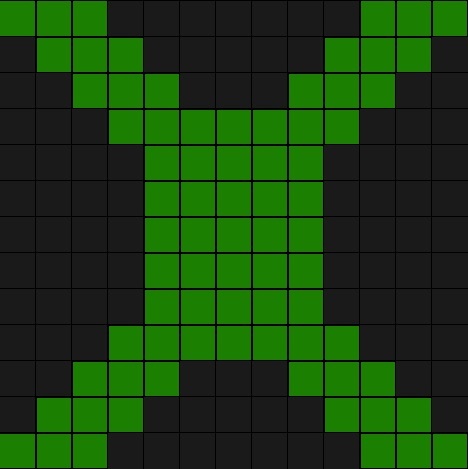 But there are also variations using alternate game boards: one in an X-shape, and another in a diamond configuration with a dead space in the middle that you can not trespass on. 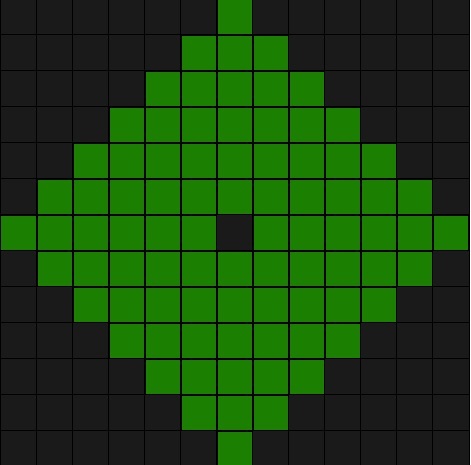 I am also planning to implement game board based on Star Wars ships, as well as other unusual board shapes as well.